Despite Vietnam’s rapid economic transition over recent years, the vast majority of the country’s rural population relies on fuel wood for lighting, heating, and cooking. Minorities in Vietnam make up about 14 percent of the population, but account for 44 percent of the country’s poor (CARE project document 2010). The majority of ethnic minorities live in Vietnam’s highlands, particularly in the north and many grow rice as their staple crop. Households that have buffalo or cows collect most of the rice straw as animal feed, while others collect the rice straw for use as a fuel. Most of the stubble is burnt in spring although some farmers burn during the winter. The burning emits a large amount of smoke; a small amount of biochar and ash are also produced, which remains in the field. A group of stove experts and researchers working with CARE Vietnam are looking at how to improve soil health while reducing the amount of indoor and outdoor pollution from smoke. They are working on a project in two mountainous provinces in northern Vietnam, Thai Nguyen and Thanh Hoa—both with high ethnic minority populations. The overall objective of this project is to contribute to sustainable rural development in the upland areas of Vietnam by simultaneously addressing energy, poverty, and soil degradation constraints, contributing to national policies on poverty reduction, deforestation, and rural advancement. Partners in the project include CARE Denmark/Vietnam (assistance with selection of stove test models, project management, and funding); Population, Environment and Development Centre (PED) (production and testing of stoves and baseline survey); Soil Fertilizer Research Institute and the University of Thai Nguyen (biochar production and testing); the women’s union and farmers union in Thai Nguyen and Thanh Hoa; Cornell University; and the University of NSW, Australia. Funding is provided by the Energy and Environment Partnership (EEP) for Mekong, Government of Finland, and CARE Denmark. In the project areas, soil erosion and leaching are severe due to high annual rainfall, which causes soil degradation, especially on the light texture soils found on slopes. Consequently, Acrisols are usually recognized as “problem soils” with limitations such as low soil nutrient contents and fertility (Care Project Document 2010). Firewood collection is the responsibility of women and children which can be very time consuming and sometimes costly for rural families. From interviews with a selection of households in Bac Kan province in the north, CARE found that women spent between one and three hours per day collecting wood. Cooking time ranged from three to eight hours per day depending on whether the household was cooking food for livestock in addition to food for the family. Most households use a very simple iron stand to cook their food. 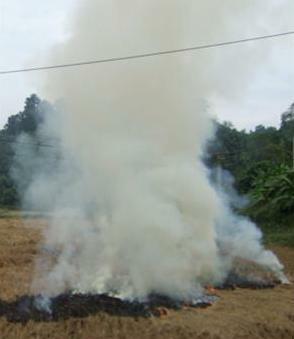 The smoke coming from the open fire is used to dry and preserve crops. To ensure that fuel wood burns efficiently in an open fire, some households have developed a technique of soaking wood and bamboo in the clay and mineral rich sludge at the bottom of ponds on the edge of rice paddies. The wood and bamboo is left for up to a year before it is taken out and air dried. This layer of minerals that remains on the wood and bamboo has the effect of reducing the volume of volatiles from heating that are liberated at any one time, and promotes combustion around the wood. One woman noted that by aging the wood in this way, her fire was stronger and cleaner. A relatively large amount of biochar and ash is actually produced using this type of mineral-enriched wood, which is then used in home gardens to grow vegetables. For over 40 years, villagers have combined the ash/biochar residue with NPK fertilizer and added it to fields. 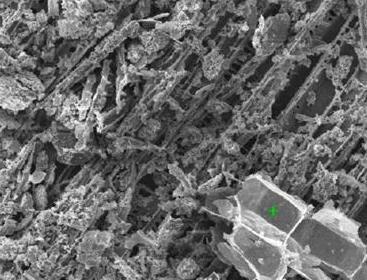 Examination of the biochar produced from this process, using a scanning electron microscope indicates that the minerals have attached to the surface of and bonded in the pores of the biochar. Village women interviewed understood the advantages of using biochar and had an interest in producing better quality and larger quantities of biochar from the rice straw field residue and from the available stock of bamboo, rice husks, tea clippings, and wood. The original concept of the project was to purchase stoves from overseas and distribute them to 400 households to try to increase the amount of biochar produced by each household, and then test this biochar in home gardens and fields. However initial trials in the area using three different stove models purchased from India strongly indicated that these stoves were not appropriate for the locally available fuel and cooking procedures. 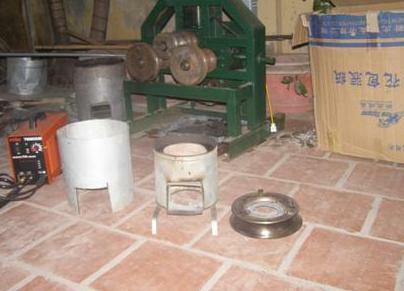 Three new biochar cookstoves were designed and built at a small metal working shop using simple hand tools. These designs were based the experience of Mr. Khoi of PED with improved cookstove design and implementation in Vietnam and on research work that had been undertaken at Cornell University by Dr. Stephen Joseph, Dorisel Torres, and Dr. Elizabeth Fisher. Initial testing at a local workshop indicated high efficiency, but due to a lack of sophisticated metal working equipment, some pyrolysis gas leakage was detected. 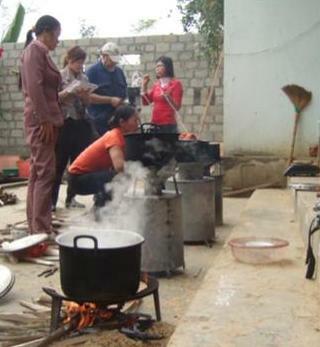 The team tested the three new stoves at Binh Thanh commune with a controlled cooking test. At the start of the test the women were given the same amount and type of fuel and food and were requested to cook rice, pork and a vegetable soup. A mixture of rice straw, rice husks, and bamboo was used in the pyrolysis chamber of the stove. The most efficient and fastest stove was DK-B1 which used approximately 60% less fuel than the open fire and produced approximately 190 g biochar. Preliminary analysis of the flue gas from the three stoves was taken using a Scout portable gas analyzer during the initial water boiling stage of the rice cooking and the initial results are encouraging. After the trials the women were asked to provide feedback on the three stoves. Overall, the feedback highlighted that the DK models were able to concentrate and keep heat much better than the traditional stove (and were less smoky), but some participants thought that they looked unwieldy and also commented on the requirements for a uniform fuel size. Based on this feedback, PED has made design modifications to the DK-B1 stove. To ensure that pyrolysis gases don’t escape before they are combusted, PED has built a sheet metal roller/former to produce a stove that emits no smoke from the top. 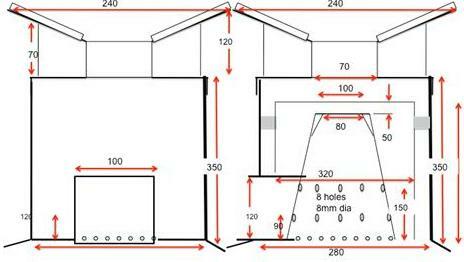 Preliminary testing of the modified stove will be carried out in approximately 20 households in February 2012, and if necessary, further modifications to the design will be made before building 400 more units. Application of biochar made from stoves to rice paddies had been planned to commence in early February, 2012. However, due to the delay in the stove development, the team decided to build a field drum oven pyrolyzer that could utilize rice straw as well as rice husks. The team chose a version of a TLUD oven developed by a farmer/engineer in Australia, Mr. Dieter Horstmann. This unit had been run successfully with wood, bamboo, and shells and consists of a drum with holes in the bottom and holes in the top lid. When the unit was initially used with straw as the feedstock, it produced a large amount of smoke. Mr. Khoi suggested putting an internal air pipe in the unit and increasing the air supply at the top of the drum. This addition helped with air supply, but the temperature in the chamber rose to over 750oC and the biochar yields of the straw was less than 20%. Dr. Joseph then suggested a strategy of coating the straw in lime and clay (similar to aging the wood in the pond), layering the straw, rice husk, and bamboo in the drum and moderating the temperature by spraying a small amount of water through the top hole into the flame. This worked well, with the biochar yield increasing to approximately 37% and the temperature being maintained between 400-500oC. When flaming pyrolysis was completed, the air at the bottom was shut off and the biomass continued to char for another hour. At the end of the charring process (about 90 minutes total), water was sprayed into the unit and the lid removed. Preliminary gas analysis was carried out and it was found that emissions of smoke were minimal and CO/CO2molar ratio was less than a third of that reported for open field burning. More comprehensive testing is required to quantify the reduction in pollution. Members of the village women’s union volunteered to learn how to operate the oven and to provide feedback. The oven operation was carried out without difficulty and the villagers saw no problems making the biochar themselves. Following the successful demonstration of the unit, another 5 ovens were built and local women produced approximately 2000 kilograms of biochar over a two week period. Some of the biochar was mixed with animal manure to make compost and field trials will commence in February. The project is now looking to increase production of the units to produce enough biochar for field testing. For more information on this project, please contact Morten Fauerby Thomsen or Stephen Joseph. Crops burned in the field; all photos courtesy of CARE Project.